I cannot lie. The reason I was compelled to sit down and invest my time in this film was because of its director, ‘Wes Craven’. As an avid horror film fan, I believe Craven to be a Master of his genre. His films have always succeeded in evoking a good scare from me, whether it be psychological (after watching A Nightmare on Elm Street (1984) for the 1st time at 15 years old, I could not sleep for weeks!) or a good jump scare, where I can feel the adrenaline rushing through my body. Craven has directed some of my all time favourite horror movies, including The Last House on the Left (1972), the above mentioned A Nightmare on Elm Street (1984) and Scream (1996). 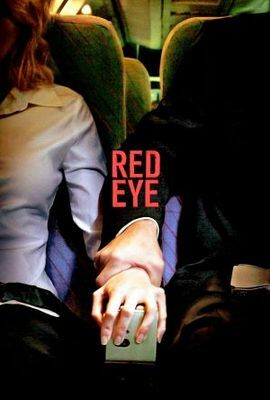 I knew nothing else of this film, Red Eye (2005), but was expecting it to be scary because of its director. 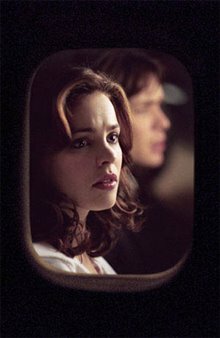 Trying not to ‘spoil’ the film too much, it is set essentially over 3 main locations – the airport, on an aeroplane and then in Lisa’s father’s house, and this accentuates the simple narrative of the film. Guy (Jackson) meets girl (Lisa) in an airport. Move onto the feeling of claustrophobia and no escape on the aeroplane. Ultimately ending in the cat and mouse chase. The film succeeds well in building suspense. I think it was roughly about half an hour into the film when you thought, ‘oh s**t’. Imagine being sat on an aeroplane. The aeroplane has taken off and is 10,000 ft in the air, and the passenger sitting next to you offers you an ultimatum – either you ring your hotel and move the specified politician to a different room so he and his family can be assassinated, or your father will be killed. What would you do? Who do you go to for help? Would anyone believe you? Would you trust that your father would be safe, even if you agreed to this plan? There is literally no escape. I felt trapped as a viewer, both physically and mentally. I thought this concept was brilliant. The idea is such a frightening one (Snakes on a Plane (2006) keeps springing to mind, without the comedy element, of course). However, I believe it was not executed as well as it could have been, as I, at no point during the scenes on the plane, felt afraid. I was slightly nervous in a couple of scenes, but never scared. One could argue that Craven was not necessarily intending for the film to have the ‘big scares’ of its predecessors and was going more for the psychological-thriller scare. Either way, I was left feeling a bit let down. Lisa’s attempts of escape consisted of good ideas, but it all felt a bit rushed to me. The third part of the film (the cat and mouse chase), is the weakest part of the film for me. Aspects did make me think of Michael Myers in Halloween (1978), whereby you think – how is this guy physically able to chase her? How did he manage to catch up with her so quickly?, but I suppose this could be considered typical to the horror genre. Ultimately, I did enjoy this film. It kept my attention. However, it is not a typical Wes Craven film as it is more of a psychological-thriller with a little bit of gore, rather than a full on horror film. I was expecting something else and that was why I felt slightly deflated. It is worth a watch for any Wes Craven fan though. Previous Previous post: Dreams and Nightmares Month: Did we miss the death of the Slasher movie?